Disclaimer: I’m a 5 Peaks Trail Crew Leader and received a complimentary entry to this race. All opinions are my own. For the second year in a row, the snow up at Mt. Seymour didn’t melt in time, despite the delayed race date. Thankfully, one of my favourite venues, Golden Ears Park accommodated us again. In order to keep things fresh, race directors decided we’d run the same course but backwards! It was a mind trip, but for me at least, I had an easier time navigating it. When we ran 5 Peaks Golden Ears the previous month, my biggest challenge was climbing Incline Trail. Since we’re going backwards, that turns into Decline Trail hah! Elevation gain was similar to the original course but this time there seemed to be more downhill, which I used to my advantage. I was slow and steady on the climbs as usual but the relatively easy terrain going down allowed me to pick up my speed a little bit. Decline Trail was a bit sketchy at parts though. It was mostly gravel and some slippery rocks but also steep at some sections. Love it when friends volunteer! One thing I need to improve on is choosing lines and thinking on my feet (so to speak) so I can quickly strategize while running. Some people passed me on this descent, which motivated me to pass them on other sections. I surprisingly ran stronger in the second half of the race even though I was tired. I’ve noticed lately that I seem to bounce back pretty well in the second half, which bodes well for me in the long run. At about 500 meters from the finish, I passed someone and kept going. I heard footsteps behind me and I thought, what? How did she catch up? Turns out it was just Cuski running me to the finish LOL. I ended with a time of 2:06:46, a 5 minute improvement from last month. Thank you gravity. The swag for this race was Swiftwick Socks. I LOVE THEM. Last year’s socks were a bit stiff, but these ones are softer and more comfortable. I love the colours and design too. 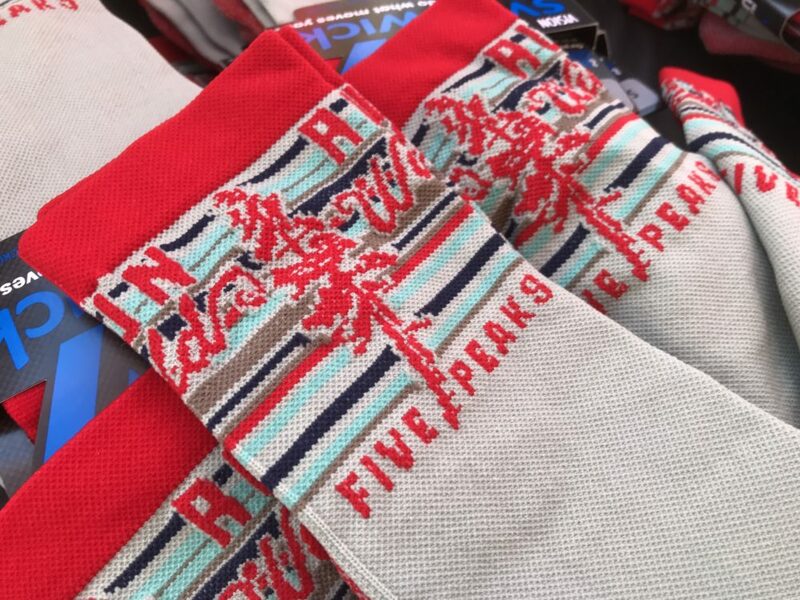 Once again, 5 Peaks doesn’t disappoint with their swag. The next race is 5 Peaks Whistler, my favourite of the series! Come race and enjoy the views (the best of the series). Sign up on their website and save with code TRAILCREW2018. I mean, look at this. It’s so beautiful. If you don’t want to race, please volunteer, it’s so rewarding. 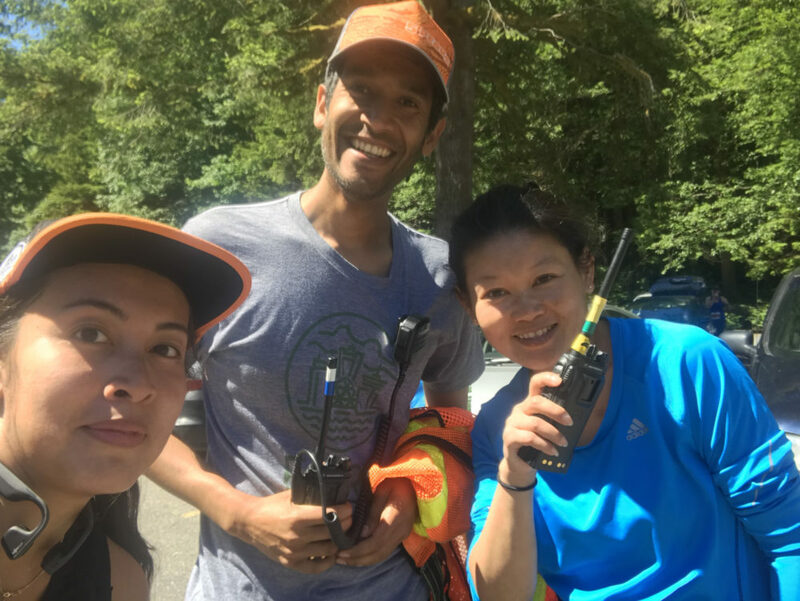 I’ve been volunteering at every race and it feels great to give back to the trail community and cheer for runners too. Email bcvolunteers@5peaks.com if you wish to help out. 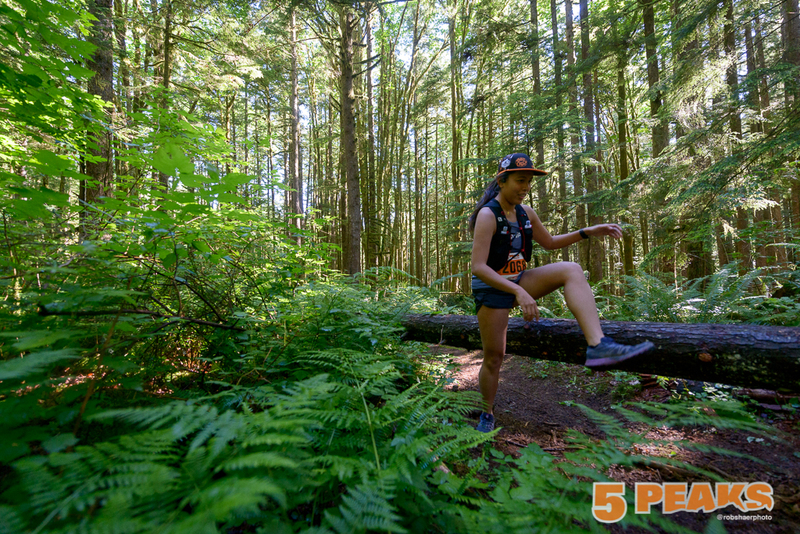 Volunteer shifts of 4 or more hours will get you a free entry to a future 5 Peaks race (except the bonus race at Buntzen Lake). Organization – No problems as usual. Clear communication especially with the last minute venue change. It was great that they decided to run the course backwards to keep things fresh. The race was smaller, understandable since the venue is further and some people couldn’t make it but we still made it fun! Course – I hope we won’t have to do this course again, mainly because we are due for a Mt. Seymour race. This is a great backup option in case Mother Nature decides otherwise for a third year in a row. Swag – Swiftwick socks… amazing. I wear them all the time. Would I Do it Again? Of course but like I said, I’d rather we return to Mt. Seymour. It’s been a while.